I am a technology geek. I know this is shocking. Probably none of you could tell. It started young for me. When all of my friends were buying the first Atari I was saving up paper route money to buy my first computer (A Commodore Vic 20). I was an early adopter of Apple products. The first home computer I owned was Apple. So was the second. I would move to the PC world after that. I would stay firmly entrenched in DOS and Windows for a good many years. I have always tried to stay knowledgeable about the cutting edge of technology. It fascinates me to see where we have been and where we are going. When I got my first teaching job I was brought back into the world of Macs. I wasn’t really too impressed. They were okay but software limitations were huge. The OS was a little clunky and not very powerful. I was the tech guy at my school though, so I learned it. OS 9 was a big step up for Apple and I began to see some real potential in where Apple was trying to go. Then the iPod was born. A startling combination of two of my passions. Music and technology. Sheri and I jumped back into the Mac world with both feet and have been there ever since. I am typing this blog on my iPad. We just bought the new iPhone. We have spent a lot of money on Apple over the years. If you have read my blog you know I am not one of those people who thinks Apple can do no wrong. In fact, for awhile there I loved poking fun at Steve Jobs by calling him Lord Jobs. I like products that work. I like technology which makes my life easier and enjoyable. Steve Jobs was a visionary when it came to producing products which could do this. I was a little wrecked when I heard he passed away. The thought I couldn’t get out of my mind was, “what great product won’t we see because the world has been deprived of his genius far too early.” In a lot of ways this was like John Lennon dying for me. Lennon was a very influential part of my childhood. Steve Jobs held the same place in my adult life. In the end I feel for his family the most. It is never easy losing someone you love. The world lost a thinker. They lost a loved one. In the end I am grateful he was able to share his vision with the world. He didn’t write software. He didn’t design the products. He was a leader. He inspired people. He brought out the best in the people who worked around him. 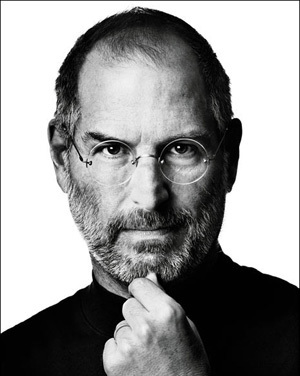 He made Apple a company which constantly thought outside the box because he, himself, would not be boxed in. He was an example to all of us. Farewell Mr. Jobs. You will be missed.